Hebei · Xianghe, China - The 4th China Xianghe International Furniture Cultural Festival, took place at the Xianghe International Furniture City from April 27th to April 30th, 2015, jointly held by China National Furniture Association and Xianghe International Furniture City. The 4th China Xianghe International Furniture Cultural Festival, China, is estimated to attract clients and professionals from more than 10,000 globally and nationally renowned furniture enterprises and more than 7,500 furniture brand names. During the festival, more than 100, 000 new and trendy furniture products are exhibited and displayed to the public. In the meantime, the festival becomes a significant platform where clients across the world deep their understanding of the investment environment of Xianghe furniture industry, investment policies, investment projects and local enterprises. The 4th China XiangheInternational Furniture Cultural Festival is dedicated to constructing a top-tier platform whereby professionals in the furniture industry can harvest high-quality dialogues with peers and seek top-notch consultancy and investment opportunities. Representatives from governments, non-governmental agencies, furniture enterprises, trade companies across the world attend the event. 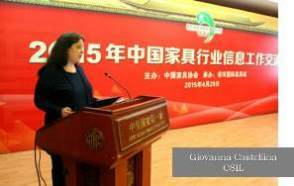 Ms. Giovanna Castellina, senior partner CSIL, is participating in the Xianghe event, giving a speech on Tuesday, April 28th focusing on ‘The Furniture Sector. A Global View’. Xianghe, deeply immersed in traditional Chinese culture, is a time-honored city. Since Ming and Qing Dynasty, Xianghe has been renowned for the industry of furniture. Hence, Xianghe has long been called the capital of furniture in China. Indeed, a multitude of furniture, which were widely used in royal palaces, gardens and mansion, were designed and produced by exceptional masters and artisans of furniture from Xianghe. During the three decades after the implementation of the milestone policy of opening up and economic reform, the furniture industry in Xianghe has been going from strength to strength. Xianghe International Furniture City, located in the economic belt of Beijing, boasts unparalleled geographical advantagesas well as solid industrial base. From the year of 2000, Xianghe International Furniture City was designated by the Xianghe County government as the pillar industrial base and began to enjoy a series of preferential policies concerning the requisition anddevelopment of land, management and tax revenue. Boosted by a host of positive policies as well as highly advanced logistics industry, Xianghe International Furniture City has blossomed at a galloping pace and earned a reputation as the hub of furniture in northern China. During the next few years, against the backdrop of the strategic shift of global furniture market to China, Xianghe International Furniture City is poised to garner greater opportunities for development. With the aim to become the top city of furniture across the world, Xianghe International Furniture City has quickened the steps of transformation and upgrading and proactively nourished and developed globally competitive and recognized brand names. In the meantime, Xianghe International Furniture City has also stepped up various efforts and measures to become the capital of furniture in greater China and the pivot of furniture production, sales and logistics in Northeastern Asia. Ever since the year of 2012, China National Furniture Association and Xianghe International Furniture City has jointly held International Furniture Cultural Festivalfor three times. This year will witness the opening of The 4thChina Xianghe International Furniture Cultural Festival. During the past three years, senior officials and policy makers from ministries of central government, presidents of Asian Furniture Association, China National Furniture Association and provincial-level furniture associations in China actively engaged with many activities of International Furniture Cultural Festival. Besides, most activities attracted representatives of national furniture associations from various countries, clients, purchasers and friends from mass media as well as cognate industries. Noticeably, the number of attendees reached a record 40,000 in 2014. As the largest furniture sales and distribution centre in northern China, Xianghe International Furniture City boasts almost 3 million square meters. Consisting of 3 individual mega-size furniture malls, more than 50 big-size furniture exhibition centers, Xianghe International Furniture City has the holistic function of wholesale and retail. Moreover, nearly 7,000 first-rate furniture factories and corporations have chosen to set up branches here. Currently, Xianghe International Furniture City has emerged as the largest office furniture and mahogany furniture market in China. Its commercial network and influences cover more than 10 provinces and autonomous regions in northern China. Additionally, a considerable number of furniture products have been exported to countries and regions in Northeastern Asia, Europe，North America and Africa. Based on the latest statistics, Xianghe International Furniture City hosts more than 20,000 clients on a daily basis and has achieved annual sales of 28 billion RMB. Armed with 16 years of healthy development, Xianghe International Furniture City has become the largest and most mature furniture market in northern China. The furniture products sold and distributed in Xianghe International Furniture City has been well received in northern China and a large number of commercial opportunities have been and will be reaped here.